Arthur was born at 24 Laurel Bank, Withington, Lancashire on 11th November 1890, the first son of Joseph Arthur (Shipping Merchant) and Alice Temple Railton, later of "Woodburn," Lightwood Road, Buxton, Derbyshire. The 1901 Census (RG 13/3670) shows the family living at 12 Morfield Road, Didsbury. Arthur had a younger brother, Oliver Campbell, and a younger sister, Dorothy T. The family were still at the same address in 1911 (RG 14/23665) Arthur was by then attending the University of Glasgow, where he gained a B.Sc. in Engineering Science (Naval Architecture). Before attending Glasgow Arthur had been at Denstone College and in 1909 joined Crosby House Oundle School in 1906. He left Oundle in December 1909. Whilst at Glasgow Arthur served 5 years in the O.T.C. His Degree and training at Glasgow got him a job at Yarrows shipyard on the Clyde in Scotland, owned by the father of fellow Oundelian Eric Yarrow [see Footnote below]. "The Register of Soldiers' Effects" show that Arthur's father, Joseph Arthur, as his Executor, received £48 from three accounts, later in 1915. [Equivalent to about £3,500 today - 2016]. A further £304 16s [£304.80] was left to his father in Arthur's Will - about £22,500 today]. 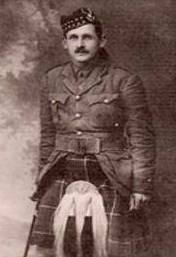 Arthur volunteered at the outbreak of the War and on 2nd September 1914 received a Commission as 2nd Lieutenant in the 4th Battalion, The Seaforth Highlanders (London Gazette 1st September 1914). His Medal Index Card indicates that Arthur entered France with his Battalion on 7th November 1914 and he served with the Meerut Division and then the Lahore Indian Division. Just before embarkation - on 1st November 1914 - he was promoted to Temporary Lieutenant, though not gazetted until 6 months later - the day before he died. (London Gazette 7th May 1915). 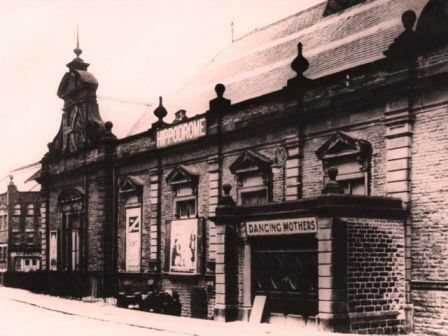 The Battalion moved to Vendin-les-Bethune on the 14th January, Richebourgh - St. Vaast on the 15th and trenches at Rue du Bois on the 17th, before being relieved on the 20th. The following month they had various spells in the trenches in the same area until moving to Vieille Chapelle on the 22nd February and into the trenches at Rue du Bois the following day. The Battalion War Diary records its position as Albert Road to Edgware Road and that it was possible to be shot in the back by bullets from German trenches north of Port Arthur! The Battalion was to move forward again to Richebourg - St. Vaast on the 10th March then to assembly positions at Windy Corner. It then took part in the attack on Bois du Biez on the 11th. At 6.00 p.m. they received orders to withdraw to reserve positions west of Neuve Chapelle, and moved to billets behind Lacouture at 2.00 a.m. on the 12th, then via L'Epinette to Richebourg-St. Vaast. Battalion historian - Lieutenant-Colonel M.M. Haldane records how the Battalion reached its billets at midnight and settled down to the first night's sleep since the 8th March. Casualties during the fighting at Neuve Chapelle were 5 Officers killed and 4 other Officers wounded; 160 other ranks killed or wounded. Colonel Haldane notes this as being almost a quarter of the number that went into action. Between the 5th and 8th May the Battalion again moved up into the Rue du Bois trenches in preparation for the attack on Aubers Ridge the following day - the 9th. War Diary records leading company going over the top wearing gas masks at 5.30 a.m. A letter from one member of the Battalion that was published in 'The Morning Post' noted how 'C' got up, scrambled, with the aid of many hands, from the trenches and flung themselves over the parapet. Immediately an absolute hail of bullets met them. 'Another company were swept by machine guns as the went over the parapet ... Moving slowly forward foot by foot the attackers trod through grass in many places even then soaking with blood.' The Battalion was relieved and withdrew to billets near Riez Bailleul. The History gives the total casualties for the Battalion on the 9th May as 216. 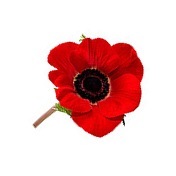 The GWGC records 3 Officers and 84 other ranks killed in action. Unlike Arthur 81 have no known grave and are commemorated on the Le Touret Memorial. Arthur's Commanding Officer wrote: "He was as brave and gallant as anyone who has ever worn a uniform and simply did not know what fear was. Had he been spared he would have gone very far in his profession as a soldier. He fell, as I am sure he wished, at the head of his men, who may and probably did equal him in bravery and gallantry, but could not possibly surpass him in either." One of Arthur's fellow Officers, Captain A.H.C. Hope, kept a diary. He reports Arthur's death near Aubers as follows: "The 1st Seaforths actually reached the enemy's trenches, but they were forced to fall back. .... As for our officers, Railton and Macdonald were pretty badly wounded at the verey start. 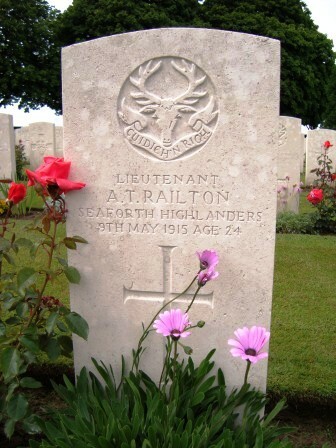 .... Railton was missed by the stretcher bearers somehow, and a couple of days later a small party went up to look for him, and they found him dead, killed by shrapnel." and as patriotic a young man as ever went into action, is the opinion of everyone who knew him." (MID), whose father Arthur worked for after leaving University, was also killed in action.